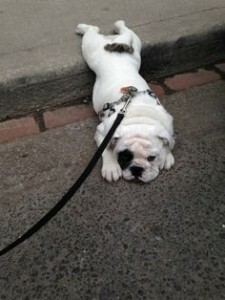 Melted Pugs & Soggy Bulldogs: More On Why Brachy’s Don’t Like Heat! We all know that those squashy-faced Brachycephalic dogs (eg Pugs, Bulldogs etc) don’t tolerate heat. A dramatic set of new photos really shows why. Dogs lose heat through their upper respiratory system – that is, they pant and breathe quickly. We know that dogs lose heat through their tongues, but they also lose heat through the turbinate system in the nose – that delicate latticework of membrane covered bones inside the nose that warms air into the respiratory system, but also helps cool it on hot summer days. 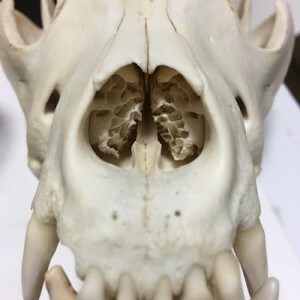 This is the skull of a wolf, showing that lacy network of turbinate bones inside the nose that manages air flows, cleans air going to the lungs and warms or cools air to just the right temperature for the body. This is the skull of a Pit Bull Terrier – a domesticated dog with great airflow and robust body shape. You can see even in this photo that turbinate size is reduced. 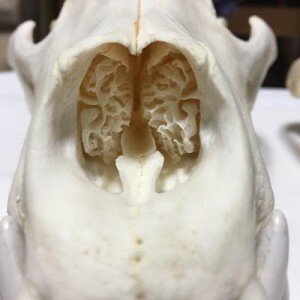 This is the skull of a Brachycephalic dog (it’s a Pug, but we don’t have it in for Pugs, it could be any Brachycephalic breed). 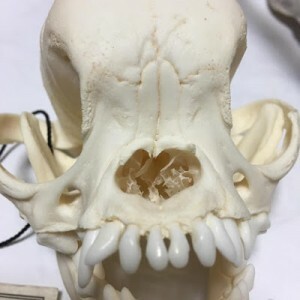 You can see that not only are those precious turbinates almost non-existent, but because the skull of flattened at the front, the sinuses (which also help regulate the temperature of air entering the body) are also squashed.